I have lived in Japan for almost 30 years, and nothing says “summer in Japan” to me like the sight and smell of those once-ubiquitous green mosquito coils. I realized this year that I don’t see them as much as I used to and am wondering why. They always seemed to work, keeping the bugs at bay, although now that I say that, I realize I don’t know how or why mosquitoes don’t like them. I don’t even know what the heck the coils are made from. Can you give us the buzz? Those mosquito coils are called katori senkō (mosquito-killing incense), and like you, I strongly associate them with summer in Japan, right up there with kakikōri (shaved ice) and the Koshien, the high-school baseball championship that takes over Japanese television for two weeks every August. Mosquito coils are widely used throughout Asia and in Africa and South America, but for some reason they never caught on much in North America and Europe. I vaguely remember seeing the occasional mosquito coil when I was growing up in the United States but most people used bug spray and citronella candles. Mosquito coils were actually invented in Japan, at the end of the 19th century. A man named Ueyama Eiichiro was in the business of exporting mandarin oranges when Fukuzawa Yukichi, the famous author, statesman and founder of Keio University, introduced him to a seed trader in the United States. This dealer offered Ueyama seeds of a flowering plant that he claimed would knock insects dead. Ueyama decided to import the seeds and start growing the plant in Japan. It was a member of the aster family, Tanacetum cinerariifolium, and certainly didn’t look like a killer. With two rows of overlapping white petals and a cheerful yellow center, the flower resembled nothing so much as the common daisy. But sure enough, there was something in the flower heads, when dried and ground into a powder, that proved lethal to insects. Ueyama called the plant jyochūgiku (which I’ll translate with a little liberty as “bug-banishing chrysanthemum”) and built a business that is still a leader in pest control today. Initially, Ueyama mixed the flower powder into starch bases to create incense sticks that would repel insects. They worked quite well but burned down too quickly, barely lasting 40 minutes. Then in 1895, when Ueyama was still searching for a way to make a longer-lasting product, his wife Yuki suggested he make longer sticks and coil them into a spiral shape. The coils were a hit and were hand-rolled until 1957 when production was mechanized. Since then, very little has changed about Ueyama’s Kincho brand-mosquito coils, including the deep green color and the old-fashioned packaging with the trademark red rooster head. 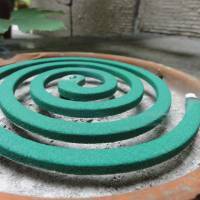 You asked why mosquitoes don’t like mosquito coils. The active compound, originally obtained from the jochūgiku flower although it can now be synthesized, is called pyrethrin. It occurs naturally in the seed cases of the flowers and has powerful insecticidal activity. In small doses it repels insects and in higher concentrations it kills them by attacking their nervous systems. Pyrethrin is a very common ingredient in insecticides around the world. By now I was itching to check your observation that katori senkō seems less evident than in previous years. I put in a call to Dai Nihon Jochugiku Co. Ltd., the current incarnation of Ueyama’s company, headquartered in Osaka. A spokeswoman assured me that the mosquito-coil market is alive and well, with strongest sales to older consumers who grew up with them. At the same time, she said, the company has added new products to keep pace with changes in the way Japanese live. Until the early postwar period, she explained, most Japanese lived in homes that were very much open to the outdoors. But there has been a shift to smaller, more tightly constructed homes. In such environments, the smoke from mosquito coils can be irritating so the company developed no-smoke alternatives. “In the 1960s, we invented devices that plug into electric outlets and diffuse mosquito repellents into the air, replenished by changing a small mat or liquid dispenser. More recently we’ve added a spray that can protect a room from mosquitoes for up to 12 hours with a single pump,” the spokeswoman told me. 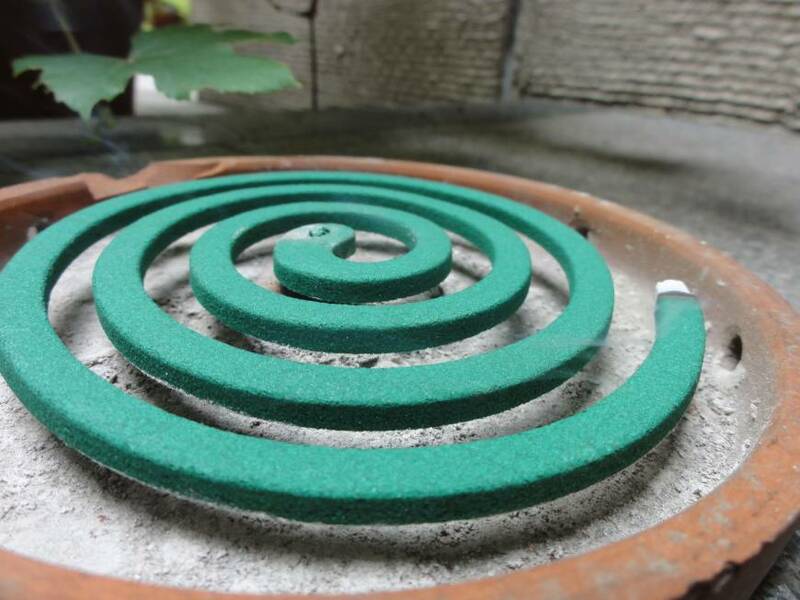 To use a mosquito coil, you first place it in a holder to keep it safe and off the ground where it can get air to burn. Simple holders are often included with the coils, but some people get quite particular about what they use to contain their coils, with pig-shaped ceramic holders being a perennial favorite. You light the outer end of the spiral and it burns slowly, progressing toward the center, emitting a mosquito-repelling smoke. There are different sizes and types, but a coil that is 75 cm long and 10.5 cm in diameter will provide protection for about seven hours. Just in case you’re planning to add katori senkō to your cocktail-party banter this summer, keep in mind that although the English word “spiral” has entered the Japanese language as “supaireru,” most people use the word “uzumaki” (“whirlpool”) when describing the shape of a mosquito coil. I have a hunch about that linguistic preference. It may be that consumers have been pulled into the undertow of the company’s marketing, since the phrase “Kincho no Uzumaki”(“the golden-bird whirlpool) has been used on mosquito-coil packaging for some 100 years. For more on this topic, including information on where to buy mosquito coils and pictures of snazzy holders for them, please visit my blog at alicegordenker.wordpress.com. Puzzled by something you’ve seen? Send it my way at whattheheckjt@yahoo.co.jp or Alice Gordenker, A&E Dept., The Japan Times, 4-5-4, Shibaura 4-chome, Minato-ku, Tokyo 108-8071.